A patient was rushed to the emergency room because he was found in the men’s public toilet sprawled on the floor, unconscious. ECG results show an inverted T wave, an abnormal Q wave, and ST segment elevation. Upon waking up, the patient narrated that he fell unconscious because of the unexplainable pain in the chest that he felt. ER doctors diagnosed him with myocardial infarction. 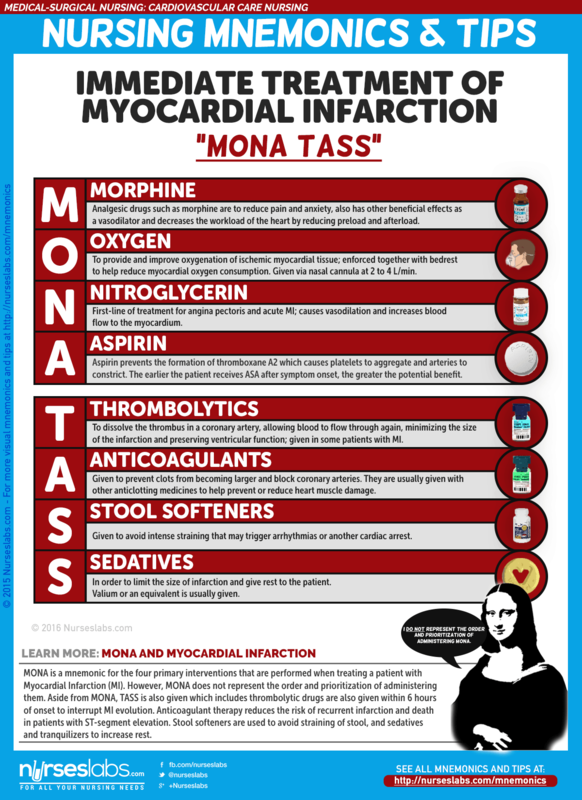 Myocardial infarction (MI), is used synonymously with coronary occlusion and heart attack, yet MI is the most preferred term as myocardial ischemia causes acute coronary syndrome (ACS) that can result in myocardial death. In an MI, an area of the myocardium is permanently destroyed because plaque rupture and subsequent thrombus formation result in complete occlusion of the artery. The spectrum of ACS includes unstable angina, non-ST-segment elevation MI, and ST-segment elevation MI. In each case of MI, a profound imbalance exists between myocardial oxygen supply and demand. Unstable angina. There is reduced blood flow in a coronary artery, often due to rupture of an atherosclerotic plaque, but the artery is not completely occluded. Development of infarction. As the cells are deprived of oxygen, ischemia develops, cellular injury occurs, and lack of oxygen leads to infarction or death of the cells. Watch the video below for a simplified pathophysiology of Myocardial Infarction by Osmosis. Let’s support them to make more great content by becoming a patron. “Time is muscle”; this is the reflection of the urgency of appropriate treatments to improve patient outcome. Each year in the United States, nearly 1 million people have acute MIs. One fourth of the people with the disease die of MI. Half of the people who die with acute MI never reach the hospital. The causes of MI primarily stems from the vascular system. Vasospasm. This is the sudden constriction or narrowing of the coronary artery. Decreased oxygen supply. The decrease in oxygen supply occurs from acute blood loss, anemia, or low blood pressure. Increased demand for oxygen. A rapid heart rate, thyrotoxicosis, or ingestion of cocaine causes an increase in the demand for oxygen. Some of the patients have prodromal symptoms or a previous diagnosis of CAD, but about half report no previous symptoms. Chest pain. This is the cardinal symptom of MI. Persistent and crushing substernal pain that may radiate to the left arm, jaw, neck, or shoulder blades. Pain is usually described as heavy, squeezing, or crushing and may persist for 12 hours or more. Shortness of breath. Because of increased oxygen demand and a decrease in the supply of oxygen, shortness of breath occurs. Indigestion. Indigestion is present as a result of the stimulation of the sympathetic nervous system. Tachycardia and tachypnea. To compensate for the decreased oxygen supply, the heart rate and respiratory rate speed up. Catecholamine responses. The patient may experience such as coolness in extremities, perspiration, anxiety, and restlessness. Fever. Unusually occurs at the onset of MI, but a low-grade temperature elevation may develop during the next few days. A healthy lifestyle could help prevent the development of MI. Exercise. Exercising at least thrice a week could help lower cholesterol levels that cause vasoconstriction of the blood vessels. Balanced diet. Fruits, vegetables, meat and fish should be incorporated in the patient’s daily diet to ensure that he or she gets the right amount of nutrients he or she needs. Smoking cessation. Nicotine causes vasoconstriction which can increase the pressure of the blood and result in MI. The diagnosis of MI is generally based on the presenting symptoms. Patient history. The patient history includes the description of the presenting symptoms, the history of previous cardiac and other illnesses, and the family history of heart diseases. ECG. ST elevation signifying ischemia; peaked upright or inverted T wave indicating injury; development of Q waves signifying prolonged ischemia or necrosis. Cardiac enzymes and isoenzymes. CPK-MB (isoenzyme in cardiac muscle): Elevates within 4–8 hr, peaks in 12–20 hr, returns to normal in 48–72 hr. LDH. Elevates within 8–24 hr, peaks within 72–144 hr, and may take as long as 14 days to return to normal. An LDH1 greater than LDH2 (flipped ratio) helps confirm/diagnose MI if not detected in acute phase. Troponins. Troponin I (cTnI) and troponin T (cTnT): Levels are elevated at 4–6 hr, peak at 14–18 hr, and return to baseline over 6–7 days. These enzymes have increased specificity for necrosis and are therefore useful in diagnosing postoperative MI when MB-CPK may be elevated related to skeletal trauma. Myoglobin. A heme protein of small molecular weight that is more rapidly released from damaged muscle tissue with elevation within 2 hr after an acute MI, and peak levels occurring in 3–15 hr. Electrolytes. Imbalances of sodium and potassium can alter conduction and compromise contractility. WBC. Leukocytosis (10,000–20,000) usually appears on the second day after MI because of the inflammatory process. ESR. Rises on second or third day after MI, indicating inflammatory response. Chemistry profiles. May be abnormal, depending on acute/chronic abnormal organ function/perfusion. ABGs/pulse oximetry. May indicate hypoxia or acute/chronic lung disease processes. Lipids (total lipids, HDL, LDL, VLDL, total cholesterol, triglycerides, phospholipids). Elevations may reflect arteriosclerosis as a cause for coronary narrowing or spasm. Chest x-ray. May be normal or show an enlarged cardiac shadow suggestive of HF or ventricular aneurysm. Two-dimensional echocardiogram. May be done to determine dimensions of chambers, septal/ventricular wall motion, ejection fraction (blood flow), and valve configuration/function. Nuclear imaging studies: Persantine or Thallium. Evaluates myocardial blood flow and status of myocardial cells, e.g., location/extent of acute/previous MI. Cardiac blood imaging/MUGA. Evaluates specific and general ventricular performance, regional wall motion, and ejection fraction. Technetium. Accumulates in ischemic cells, outlining necrotic area(s). Coronary angiography. Visualizes narrowing/occlusion of coronary arteries and is usually done in conjunction with measurements of chamber pressures and assessment of left ventricular function (ejection fraction). Procedure is not usually done in acute phase of MI unless angioplasty or emergency heart surgery is imminent. Digital subtraction angiography (DSA). Technique used to visualize status of arterial bypass grafts and to detect peripheral artery disease. Magnetic resonance imaging (MRI). Allows visualization of blood flow, cardiac chambers or intraventricular septum, valves, vascular lesions, plaque formations, areas of necrosis/infarction, and blood clots. Exercise stress test. Determines cardiovascular response to activity (often done in conjunction with thallium imaging in the recovery phase). The goals of medical management are to minimize myocardial damage, preserve myocardial function, and prevent complications. Morphine administered in IV boluses is used for MI to reduce pain and anxiety. ACE Inhibitors. ACE inhibitors prevent the conversion of angiotensin I to angiotensin II to decrease blood pressure and for the kidneys to secrete sodium and fluid, decreasing the oxygen demand of the heart. Thrombolytics. Thrombolytics dissolve the thrombus in the coronary artery,allowing blood to flow through the coronary artery again, minimizing the size of the infarction and preserving ventricular function. The procedure is used to open the occluded coronary artery and promote reperfusion to the area that has been deprived of oxygen. PCI may also be indicated in patients with unstable angina and NSTEMI for patients who are at high risk due to persistent ischemia. The nursing management involved in MI is critical and systematic, and efficiency is needed to implement the care for a patient with MI. One of the most important aspects of care of the patient with MI is the assessment. Assess for chest pain not relieved by rest or medications. Monitor vital signs, especially the blood pressure and pulse rate. Assess for presence of shortness of breath, dyspnea, tachypnea, and crackles. Assess for nausea and vomiting. Assess for decreased urinary output. Assess for the history of illnesses. Perform a precise and complete physical assessment to detect complications and changes in the patient’s status. Based on the clinical manifestations, history, and diagnostic assessment data, major nursing diagnoses may include. Ineffective cardiac tissue perfusion related to reduced coronary blood flow. Risk for ineffective peripheral tissue perfusion related to decreased cardiac output from left ventricular dysfunction. Deficient knowledge related to post-MI self-care. Relief of pain or ischemic signs and symptoms. Maintenance or attainment of adequate tissue perfusion. Absence or early detection of complications. Heart rate/rhythm sufficient to sustain adequate cardiac output/tissue perfusion. Achievement of activity level sufficient for basic self-care. Disease process, treatment plan, and prognosis understood. Prevent/detect and assist in treatment of life-threatening dysrhythmias or complications. Nursing interventions should be anchored on the goals in the nursing care plan. Administer oxygen along with medication therapy to assist with relief of symptoms. Encourage bed rest with the back rest elevated to help decrease chest discomfort and dyspnea. Encourage changing of positions frequently to help keep fluid from pooling in the bases of the lungs. Check skin temperature and peripheral pulses frequently to monitor tissue perfusion. Provide information in an honest and supportive manner. Monitor the patient closely for changes in cardiac rate and rhythm, heart sounds, blood pressure, chest pain, respiratory status, urinary output, changes in skin color, and laboratory values. There is an absence of pain or ischemic signs and symptoms. The most effective way to increase the probability that the patient will implement a self-care regimen after discharge is to identify the patient’s priorities. Education. This is one of the priorities that the nurse must teach the patient about heart-healthy living. Home care. The home care nurse assists the patient with scheduling and keeping up with the follow-up appointments and with adhering to the prescribed cardiac rehabilitation management. Follow-up monitoring. The patient may need reminders about follow-up monitoring including periodic laboratory testing and ECGs, as well as general health screening. Adherence. The nurse should also monitor the patient’s adherence to dietary restrictions and prescribed medications. Vital signs, cardiac rhythm, presence of dysrhythmias. 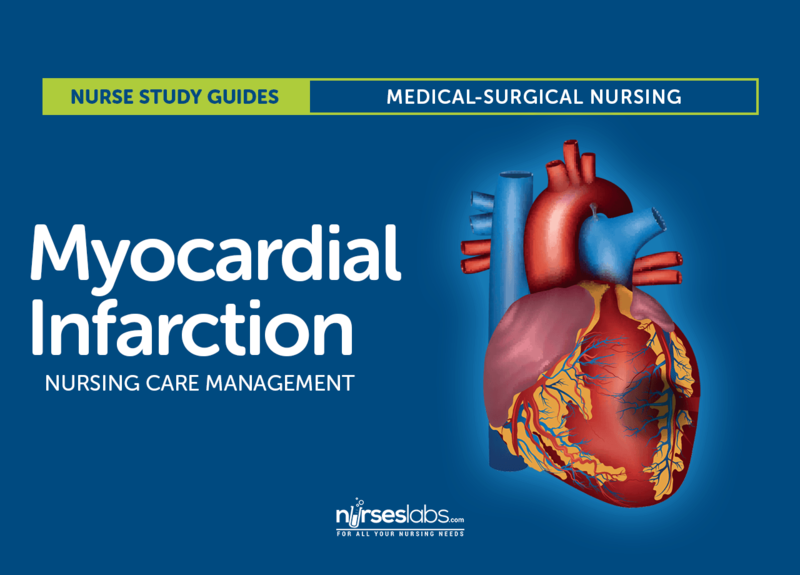 Let’s reinforce what you’ve learned with this 5-item NCLEX practice quiz about Myocardial Infarction. Which of the following is the most common symptom of myocardial infarction (MI)? A: The most common symptom of an MI is chest pain, resulting from deprivation of oxygen to the heart. B: Dyspnea is the second most common symptom, related to an increase in the metabolic needs of the body during an MI. C: Edema is a later sign of heart failure, often seen after an MI. D: Palpitations may result from reduced cardiac output, producing arrhythmias. C: Morphine administered in IV boluses is used for MI to reduce pain and anxiety. A: Meperidine hydrochloride is not the analgesic of choice for MI. B: Hydromorphone hydrochloride is not the analgesic of choice for MI. D: Codeine sulfate is not the analgesic of choice for MI. A: An absent P wave is not part of the classic changes seen in an ECG result. B: An abnormal Q wave is an indication of MI. C: T-wave inversion is a classic ECG change in a patient with MI. D: ST segment elevation is an indication of MI. Which of the following statements about myocardial infarction pain is incorrect? It is relieved by rest and inactivity. It is substernal in location. It is sudden in onset and prolonged in duration. It is viselike and radiates to the shoulders and arms. A: MI pain continues despite rest and medications. B: The pain occurs substernally or at the chest area. C: MI pain occurs suddenly and is prolonged in duration. D: The pain grips the patient like a vise and radiates towards the arms or the shoulders. B: CK-MB is the isoenzyme for the heart muscle and the cardiac-specific enzyme. A: Alkaline phosphatase is not part of the creatine kinase isoenzymes. C: Myoglobin is a heme protein that helps transport oxygen. D: Troponin regulates the myocardial contractile process. 1. 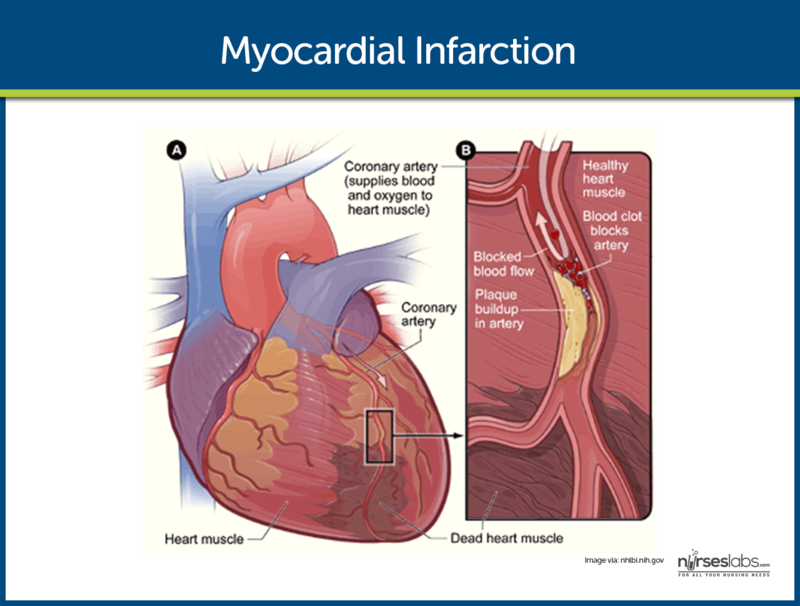 Which of the following is the most common symptom of myocardial infarction (MI)? 4. Which of the following statements about myocardial infarction pain is incorrect? A. It is relieved by rest and inactivity. B. It is substernal in location. C. It is sudden in onset and prolonged in duration. D. It is viselike and radiates to the shoulders and arms. 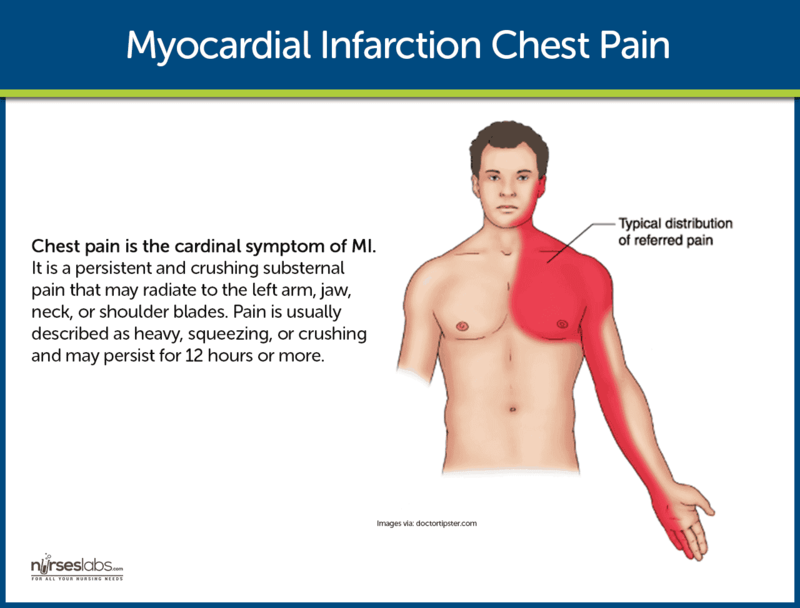 A: The most common symptom of an MI is chest pain, resulting from deprivation of oxygen to the heart. B: Dyspnea is the second most common symptom, related to an increase in the metabolic needs of the body during an MI. C: Edema is a later sign of heart failure, often seen after an MI. D: Palpitations may result from reduced cardiac output, producing arrhythmias. C: Morphine administered in IV boluses is used for MI to reduce pain and anxiety. A: Meperidine hydrochloride is not the analgesic of choice for MI. B: Hydromorphone hydrochloride is not the analgesic of choice for MI. D: Codeine sulfate is not the analgesic of choice for MI. A: An absent P wave is not part of the classic changes seen in an ECG result. B: An abnormal Q wave is an indication of MI. C: T-wave inversion is a classic ECG change in a patient with MI. D: ST segment elevation is an indication of MI. 4. Answer: A. It is relieved by rest and inactivity. A: MI pain continues despite rest and medications. B: The pain occurs substernally or at the chest area. C: MI pain occurs suddenly and is prolonged in duration. D: The pain grips the patient like a vise and radiates towards the arms or the shoulders. B: CK-MB is the isoenzyme for the heart muscle and the cardiac-specific enzyme. A: Alkaline phosphatase is not part of the creatine kinase isoenzymes. C: Myoglobin is a heme protein that helps transport oxygen. D: Troponin regulates the myocardial contractile process.